Tamron has been refreshing their lens lineup with some very attractive models recently. These models have been attractive from an aesthetic, functional and performance perspective. Also attractive is that Tamron's latest lenses all have VC (Vibration Control) and VC is an especially big attraction in the Tamron 10-24mm f/3.5-4.5 Di II VC HLD Lens. Also new in this lens is Tamron's "HLD" focusing system. All kits need at least one wide angle zoom lens in them (my opinion of course) and, being a significant upgrade from Tamron's predecessor lens that I evaluated over 6 years ago, the Tamron 10-24 VC lens wants to be that lens for you. With so many alternative wide angle zoom lenses available, does this Tamron lens become the best option? In addition to figuring the Tamron 10-24 VC lens out, the best wide angle zoom lens for 1.6x FOVCF DSLR cameras question is one I wanted to answer for myself. 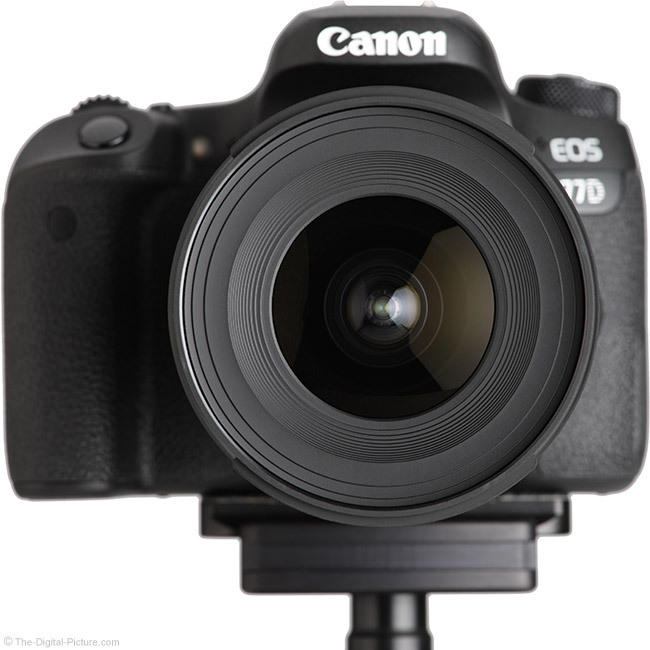 What is the 10-24mm focal length range good for? Before I answer that question, let's clarify that this lens is designated as a "Di II", designed to cover an APS-C image circle. This means that it, on APS-C format cameras, this lens frames a scene similar to a 1.6x-longer focal length range on a full frame body, or similar to a 16-38mm lens. You likely recognized that this angle-of-view-equivalent focal length range matches up very closely with the common 16-35mm full frame lenses, and this lens' uses mirror the same. Very good is that the list of uses for this angle of view range is huge. A general purpose lens may get more use, but a 10-24mm lens is usually the second or third most-important lens in many kits. 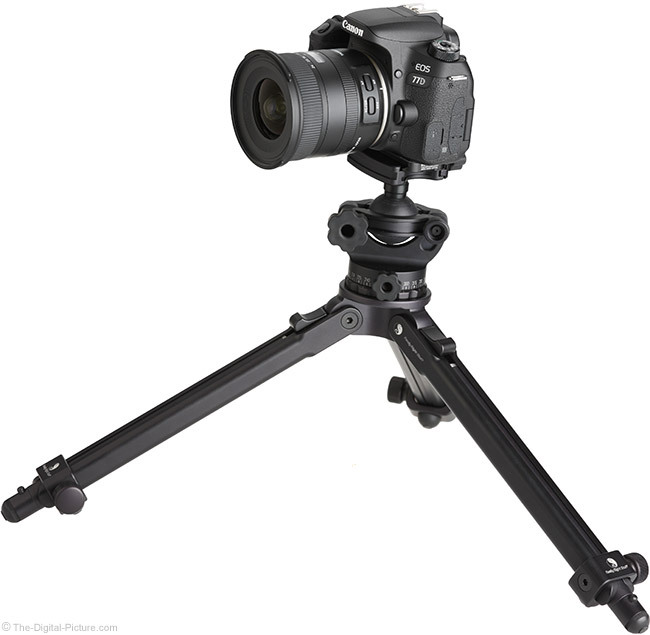 A large majority of photographers find it valuable to have this angle of view range covered in their kits. In general, the wider the angle of view being used, the more challenging it is to compose a great image. A telephoto lens makes composing an image relatively easy as narrow angles of view include less background and that background can be more easily blurred into obscurity. A wide angle of view, especially 10mm in this lens, takes in a big scene and allows unique perspectives with more background showing – and that background is less-easily blurred away. This means that more-careful attention must be paid to the composition. I think the award of a well-composed wide angle image is worth every ounce of the effort required to get it. As I've said before, I love wide angle lenses, I love the wide angle compositional challenge and I especially love the wide angle results. 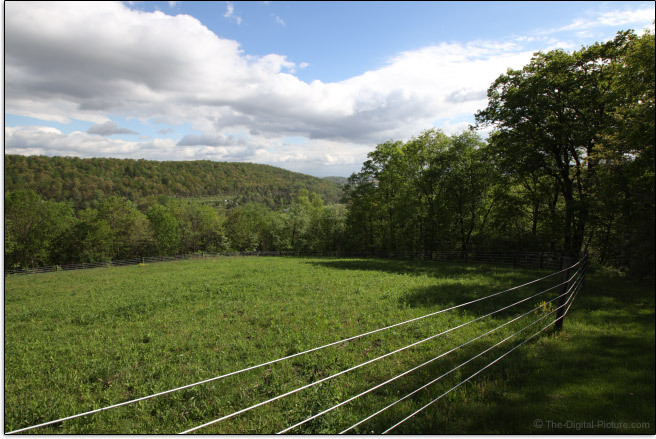 I would classify those images as being in the "landscape" genre and landscape photography is one of the most common uses for the this lens' focal length range. This world is full of natural beauty awaiting your capture and these wide angles are among the best available for that purpose. The rewards of that pursuit will look great adorning your walls. This is a great focal length range to have when traveling, for showing the scenery of the destination and especially for photographing in tight places including building interiors. This range is good for architecture and for real estate photography, with the wide angle of view making spaces appear larger. The wide end of this focal length range is great for environmental portraits, the long end works well for full-body portraits and the entire range can work for group photos. Having a birthday party? This lens can get everyone in the frame even if the room is small. While this lens works great for capturing people, keep in mind that you do not (usually) want to get too close to them due to the resulting perspective distortion (noses start becoming much larger than ears, etc.). Get the telephoto lens out for your tightly-framed portraits. The 10-24mm focal length range can take care of the wide angle work at weddings, at events and for other photojournalism needs. For similar reasons, many sports photographers carry a wide aperture wide angle zoom with them. While this lens may not have the aperture desired for stopping low light action, it does not have a problem doing so under good light. While I consider this lens' focal lengths to be wider-than and just-covering the wider end of a typical general purpose lens, the range still has a lot of general purpose application and if your primary needs dictate wider angles of view, this lens could even make a good primary zoom lens for you. 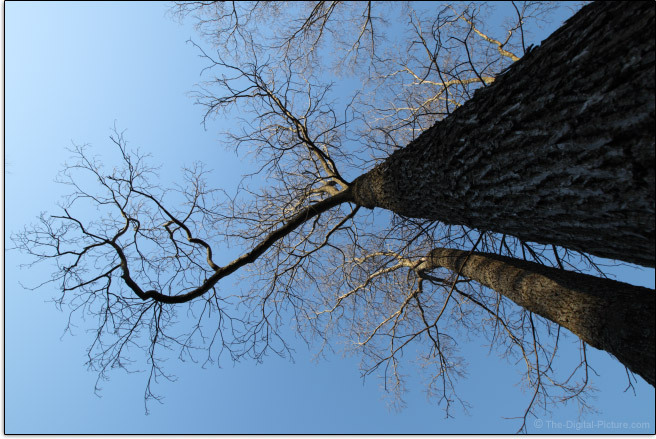 Do you feel like you are under this tree looking up? Wide angle focal lengths give that feeling to your images, making the viewer feel present in the scene. Another detriment to full frame usage of the 10-24 VC is that the results seen outside of the APS-C image circle are not sharp (to be kind). Using an APS-C lens on a full frame body is seldom a good idea, but ... it can sometimes get the job done. Crop the APS-C center from the full frame images and you basically have the equivalent of using an APS-C body in the first place and sometimes that is all that is needed, perhaps bridging a gap during a full frame upgrade. When it comes to max aperture relative to focal length, there are a few facts you can count on. Of course, the smaller the number, the wider the aperture is resulting in more light reaching the sensor, a shallower depth of field and a stronger background blur, factors which make wider apertures desirable for a plethora of situations. 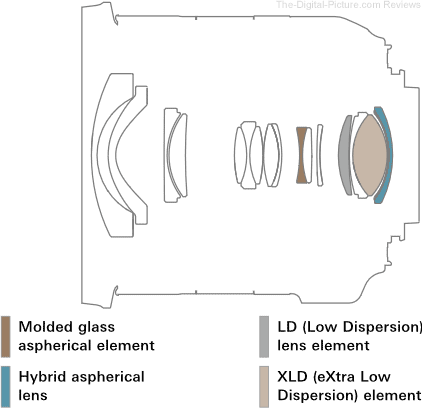 Because a wider aperture requires larger lens elements, the wider the aperture, the larger, heavier and more expensive the lens becomes. Keep the aperture the same and increase the focal length and you often (though not always) increase the size and weight of the lens (aperture is measured as a ratio of lens opening to focal length). Therefore, to give a zoom lens an efficient max aperture to cost/size/weight/price ratio, a variable max aperture is commonly used. In this case, as easily seen in the product name, this lens' max aperture is a variable one, ranging from f/3.5 at 10mm to f/4.5 at the longer end. Here is a table showing the max aperture step-down for a number of similar lenses. As you can see, there are numbers all over place in this alphabetically-sorted list. The few fixed-max aperture lenses included are, overall, the fastest available, but even these have a variety of max apertures. The Tamron 10-24 VC lands somewhere in the middle of the class and its f/3.5 max aperture can only be used at 10mm through 11mm. Interesting is that this lens' predecessor is slightly advantaged in this regard. Wide angle lenses are not the best for creating a strong background blur and this example shows the strongest this lens can create. While you can discern the elements in the background, they are blurred enough to create some separation from a very close subject photographed at 24mm f/4.5. As you likely noticed in the previous table, there are a lot of contenders in the APS-C wide-angle zoom lens class. Not as easily recognizable is that only two of them offer image stabilization. 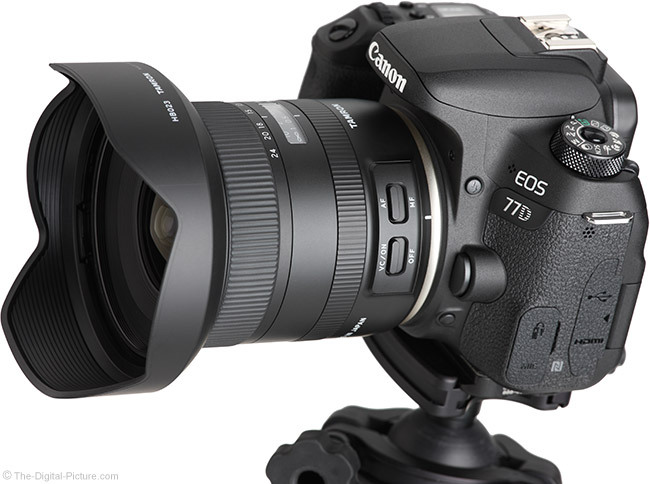 The Canon EF-S 10-18mm f/4.5-5.6 IS STM was the first lens in this class to provide this feature and now the Tamron 10-24mm f/3.5-4.5 Di II VC (Vibration Control) HLD Lens has it. Is optical stabilization useful in a wide angle lens? Absolutely. Though not all applications for this lens are advantaged by Vibration Control, many are greatly aided by this feature. Optical stabilization systems have shown advancement over the years and the 4-stop VC implementation in this lens is really nice. Some light clicks can be heard during startup and shutdown and if an ear is close to the lens in a quiet environment, some light humming can be heard. With VC in use, the image in the viewfinder immediately becomes very still with negligible drifting; I don't feel like I'm fighting against VC when I adjust framing. Of course, ultimate importance is how VC affects image quality. In that regard, under ideal conditions, at 10mm, a solid percentage of my test images were sharp at .8 second shutter speeds with a slow taper off in keeper rate until practically no images were sharp at exposures longer than 1.3 seconds. Remarkably, 9 of 16 1.3 second exposures were sharp. At 24mm, a solid percentage of the results were sharp and .4 - .5 second shutter speeds with a taper off in keeper rate until practically no images were sharp at exposures longer than 1.3 seconds. I'm quite impressed by the performance of Tamron's VC implementation in this lens. While VC does not help stop subjects in motion, it does a remarkable job at stopping camera shake. VC greatly increases the versatility of this lens, making it a great choice for handholding in low light venues. Note that with the optional accessory Tamron TAP-in Console (more about this later), you can customize the VC system, selecting optionally Standard, viewfinder image-stabilization priority or capturing image-stabilization priority. The Tamron 10-24mm f/3.5-4.5 Di II VC HLD Lens has a completely new design – not one borrowed from its predecessor. And, this new design includes some quality elements as seen in the following diagram. It is common for lens manufacturers to publish MTF charts, indicating expected performance from their lens designs and Tamron has done that for the 10-24mm f/3.5-4.5 Di II VC HLD Lens. The higher the lines, the better the expected performance. The left side of the charts represent the center of the image circle and the line values are quite high at this location of the chart. With light bending the least in the center of the frame, it is very common for lenses to perform their best in the center of the frame and that is the case with this lens. In the center of the frame, the Tamron 10-24mm VC lens is very sharp wide open and stopping down to f/5.6 shows only a modest increase in contrast, primarily at the long end of the focal length. In addition to our standard lab tests, I like to share some real world examples. 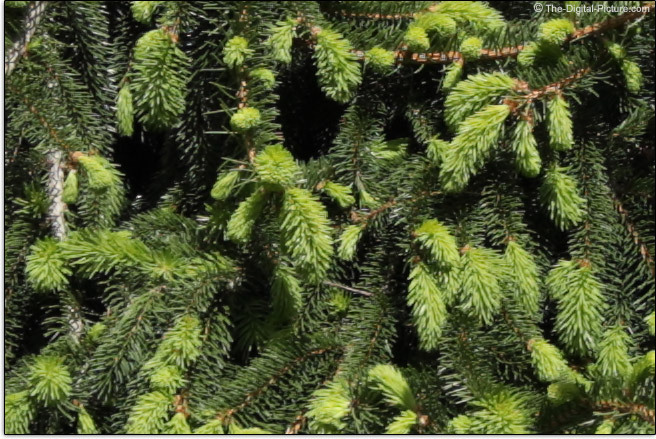 The images below are 100% resolution center of the frame crops captured in RAW format using a Canon EOS 77D. These images were processed in DPP using the Standard Picture Style with sharpness set to "1". I didn't include narrower aperture results because ... they didn't add any value. This lens is practically as sharp as it gets at the shared apertures and this lens is very sharp in the center. Corner performance typically trails center-of-the-lens performance and this expected performance attribute can be seen in the MTF charts. The lines dip toward the right side of the charts with the drop in expected performance being quite strong at the right side of the 10mm chart. Testing confirms the expected and especially at 10mm, the lens is rather soft in the corners. Stopping down usually helps corner image quality and this lens, especially at the mid and longer focal lengths, improves noticeably at narrow apertures. I can't say that I'm completely excited by the corner-of-the-frame image quality being delivered by any APS-C wide angle zoom lens available to date and the Tamron 10-24 VC has not changed my opinion. However, the 10-24 VC shows significant improvement in this regard over its predecessor (at least at the wide end). Here is a real world look at the extreme top-left corner of images captured with a 77D and processed as-above. 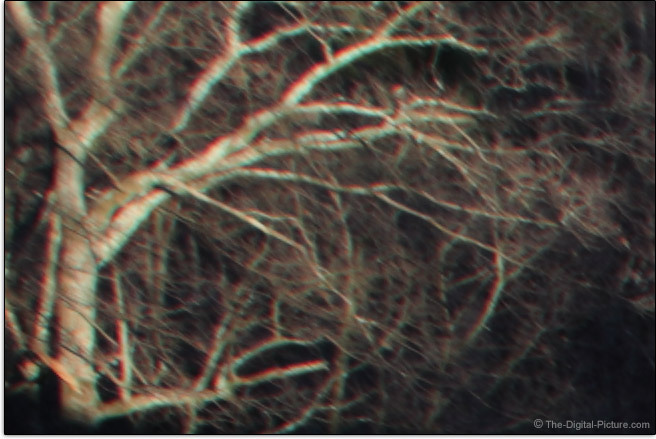 I'll specifically address Lateral (or transverse) CA (Chromatic Aberration) below, but ... that is the cause of the ready-for-3D-viewing look of the 10mm corner results. The 10mm corners are simply soft at f/3.5 and while they show improvement until f/8, they are still not very impressive at this point and with the effects of diffraction becoming more apparent at f/11, the results at this aperture were no better than the f/8 results (for any focal length) and did not warrant sharing. Especially because of the reduced lateral CA, the mid and long focal lengths are performing better in the wide aperture corners, but they are still not amazing. Stopped down, the corners are not looking too bad. At each focal length shared above, the corners become brighter at narrower apertures and this is of course due to decreased vignetting. Vignetting is normally seen when a camera is utilizing the full image circle of a lens designed for it. Want less vignetting? Use a full frame lens on an APS-C body or use a narrower aperture. In this case, wide open vignetting ranges from a not-bad 1.5 stops at 10mm to modestly even less over the rest of the focal lengths. At f/5.6, expect an often-just-noticeable about-1-stop of corner shading over the full focal length range. Shading gradually decreases as the aperture narrows, but about .8 through .5 stops remain from wide to long at f/11. I mentioned Lateral CA. If the all wavelengths of light in the visible spectrum refracted identically, a lens designer's job would be a lot easier. Because they do not, we get aberrations caused by various wavelengths of light being magnified and focused differently. 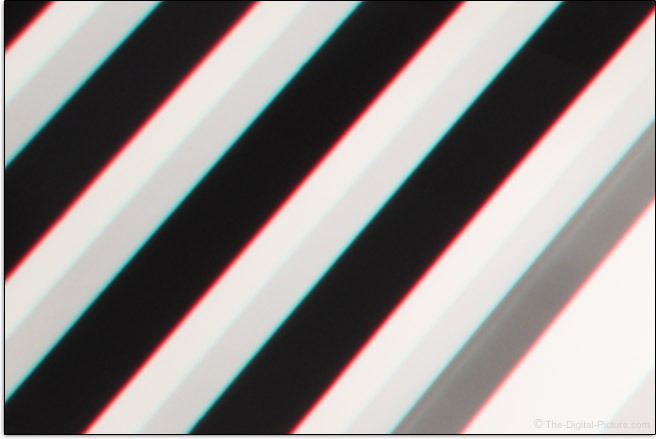 Lateral CA, shows as different colors of the spectrum being magnified differently with the mid and especially the periphery of the image circle showing color fringing along lines of strong contrast running tangential (meridional, right angles to radii) and that is what we see showing strongly in the 10mm corner crops above. Following are 100% crop examples taken from the extreme corner of EOS 77D images showing an essentially worst-case, white-on-black scenario. The lateral CA in the 10mm corners is very strong – among the strongest you will find in a modern lens, though not unusual for this class of lens. Zooming in slightly to 13mm makes a marked improvement in this regard and by 15mm, lateral CA is well under control. Practically no lateral CA is visible at 24mm. The good thing is that lateral CA is easily software corrected by radially shifting the colors to coincide. Programs such as Adobe Camera RAW (utilized by Photoshop and Lightroom) feature lens profiles for correcting CA in RAW images created using third-party lenses, and the current version of ACR indeed supports this lens. Unfortunately, Tamron does not make cameras and it is unlikely that a camera manufacturer will load Tamron lens profiles in their cameras. That means lateral CA correction is not available for JPG format image capture and that this CA will be recorded in videos. 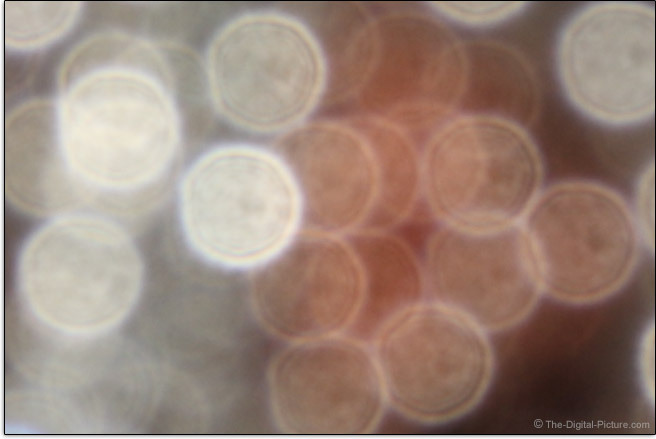 A relatively common lens aberration is axial (longitudinal, bokeh) CA, which causes non-coinciding focal planes of the various wavelengths of light, or more simply, different colors of light are focused to different depths. Spherical aberration along with spherochromatism, or a change in the amount of spherical aberration with respect to color (looks quite similar to axial chromatic aberration, but is hazier) are other common lens aberrations to look for. Axial CA remains at least somewhat persistent when stopping down with the color misalignment effect increasing with defocusing while the spherical aberration color halo shows little size change as the lens is defocused and stopping down one to two stops generally removes this aberration. In the real world, lens defects do not exist in isolation with spherical aberration and spherochromatism generally found, at least to some degree, along with axial CA. These combine to create a less sharp, hazy-appearing image quality at the widest apertures. Even though this lens is impressively sharp in the center of the frame, there is some color fringing differences seen when comparing the foreground and background results. 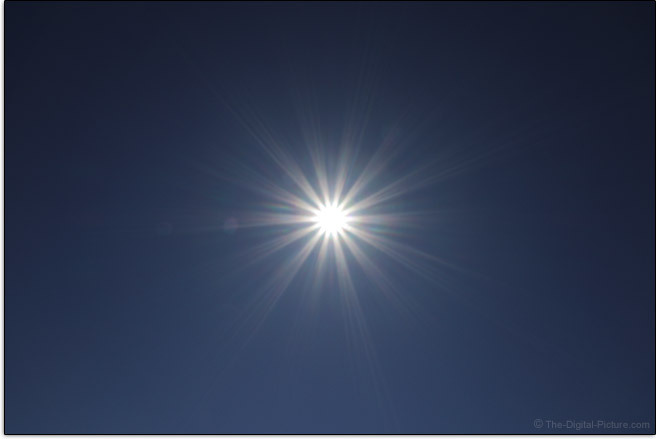 Put the sun or another bright light source in the frame and flare becomes an image quality issue, one that at times can be very difficult to remove during post processing. Bright lights are easier to get in the frame when using wide angle focal lengths and thus, flare is often a bigger consideration with such lenses. Tamron advertises their use of BBAR (Broad-Band Anti-Reflection) Coating to help, among other things, keep flaring to a minimum. While flare is not absent in this lens, it is rather well controlled, especially when the moderately high lens 16/11 element/group count is considered. Expect more flare effects to be visible at narrower apertures (this is normal) with some streaks of flaring becoming visible in some cases. Coma or comatic aberration is a lens defect that is commonly seen in the corner of the frame of wide angle lenses. Coma is generally recognized by sharp contrast towards the center of an image and long, soft contrast transition toward the image periphery. It is most visible in wide aperture corners and significantly resolves when the lens is stopped down. The pin-point stars in the night sky are the subject that makes this aberration, along with some others, most easily recognizable to me. Because of its moderately narrow max aperture, the Tamron 10-24 VC is not a first consideration star lens for most, but ... it can be used for such. 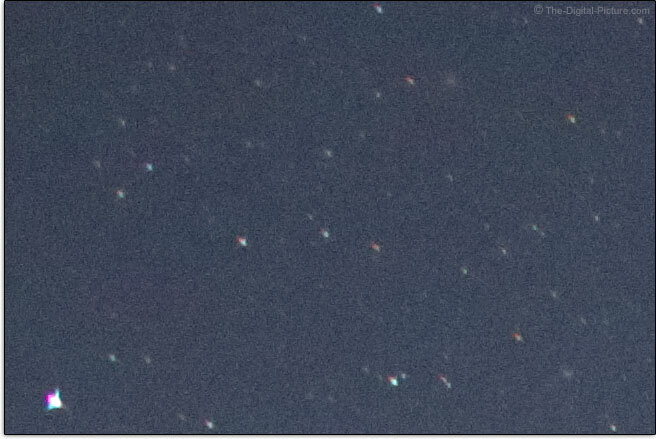 Here is a look at near-corner stars from the labels focal lengths. The results at 10mm show moderately strong aberrations (including the lateral CA again) while the results at 24mm are not too bad with stars being primarily round. Note that the stars are larger at 24mm as they should be. Typical for wide angle zoom lenses is for the wide end to shows barrel distortion that transitions into pincushion distortion at the long end and this lens shows the same. I'll describe the 10mm barrel distortion as strong. The transition to negligible distortion is around 18mm and by 24mm, the pincushion distortion is moderate. Distortion correction is available during post processing, though it is a pixel-level-destructive process. While a wide angle zoom lens with only moderately-wide apertures available is not going to deliver an amazing amount of background blur, this lens can still create some blur when used for a close subject. The quality of that blur, referred to as bokeh, is pleasant. 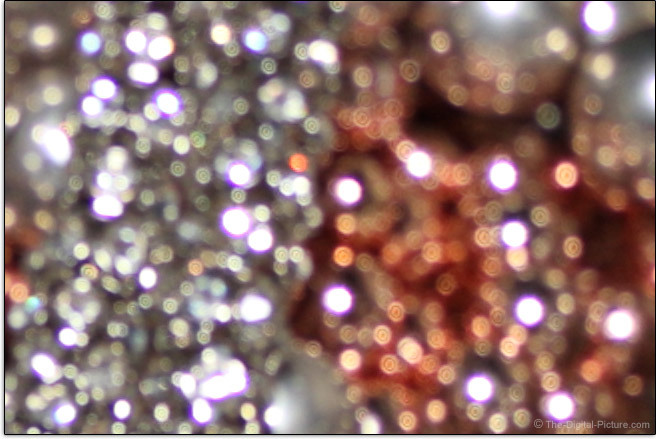 Here are some examples of out-of-focus specular highlights at f/8.0. While the 10mm results appear a bit harsh, the 15 and 24mm results are looking normal/fine and all have a good roundness to them thanks to the rounded aperture blade design. The 10-24 VC lens features fluorine coating on (minimally) the front lens element, helping that element shed dust and moisture and making it easier to clean. Overall, though not perfect, this lens is delivering image quality that is similar to the best-available in this class. Lens manufacturers usually indicate the focus drive system present in their lenses right in the lens name. Tamron's lenses have most recently included the "USD" acronym, referring to the Ultrasonic Drive motor found in them. 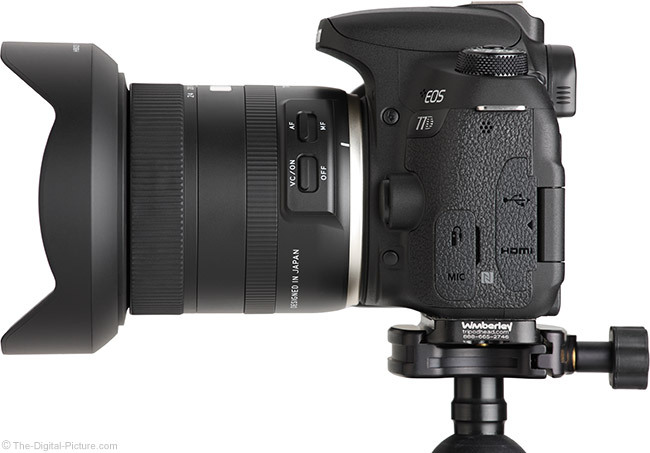 Replacing the USD acronym in this lens' name is Tamron's new "HLD". What is HLD? Good question. What I found is that the focus speed of this lens, though not extremely fast, is reasonably quick and that is reasonable-enough for a lens that will often be found focused at or near infinity. Short focus distance changes happen very quickly, but the duration of a full extent distance adjustment is noticeable. Focus transitions are smooth and well-suited for Movie Servo AF during video capture. The shuffling focus elements are audible during AF and though not loud, the camera's built-in mic will pick them up. This lens focuses internally and full-time manual focusing is supported. The wide angles and only moderately-wide max apertures found in this lens are not overly challenging to an autofocus system and the focus accuracy of this lens has been reasonable. It is not perfect, but a relatively high percentage of images are properly focused. In a full extent focus distance adjustment at 10mm, a very slight subject magnification change takes place, but at 24mm, there is practically no change in subject size even with a full range distance adjustment. This is one of the best zoom lenses I've used in this regard and fans of this attribute will include photographers intending to use focus stacking techniques, videographers pulling focus and those very-critically framing a scene. A focus distance scale is provided in a window, but like other lenses in its class, the 10-24 VC omits DOF (Depth of Field) markings. While parfocal-ness can be an individual lens-specific attribute, near-parfocality is a characteristic the reviewed lens exhibits. There is practically no focus distance adjustment needed when zooming from 10mm to 24mm and vice versa. The manual focus ring is rather small and is nearly flush with the lens barrel. The ridges on the ring are very slightly raised above the barrel and while the ring is not rubberized like the zoom ring, it is not hard to grasp. The focus ring is easy to turn, has a large 175° rotation and has just a small amount of play. While the 9.4" (239mm) MFD (Minimum Focus Distance) appears to be practically standard for lenses in this class, the 24mm focal length is longer than most of the rest and that factor gives this lens a .19x MM (Maximum Magnification) that is higher than most of the other options. 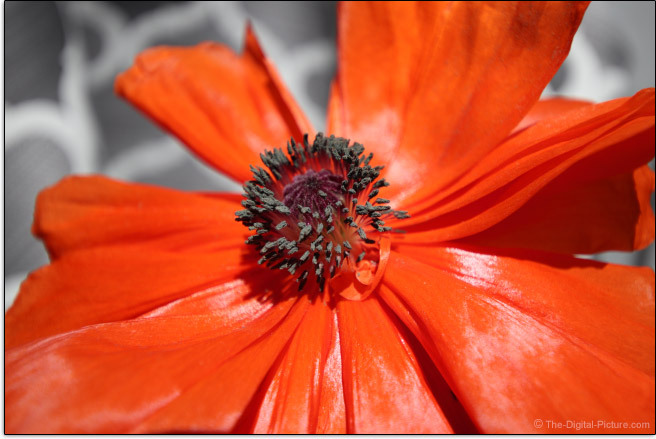 While a .19x MM is not extraordinary, it is high enough to make moderately small subjects fill the frame, as the 5" (13cm) diameter poppy flower illustrates below. Magnification from wide angle lenses is significantly increased with the use of extension tubes which are basically as their name implies, hollow tubes (with electronic connections) that shift a lens farther from the camera. Doing so allows the lens to focus at closer distances, though at the expense of long distance focusing. Mounting a 12mm extension tube behind this lens makes a huge difference in magnification, but the lens is usable only at the long end of the focal length range and there is, at most, very little working distance and this means that subject illumination is challenging. Tamron has been turning out very nicely-designed lenses and this one is no different. 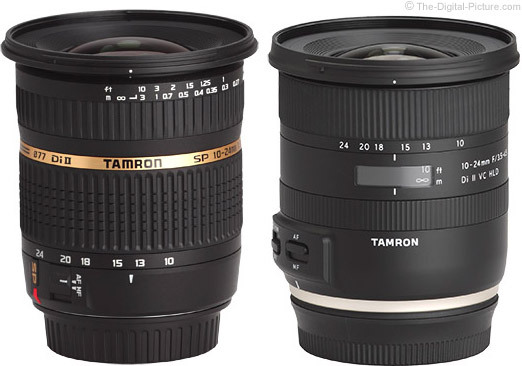 The comparison image below shows the Tamron 10-24mm VC Lens beside the previous model. The change is rather dramatic. The Tamron 10-24mm f/3.5-4.5 Di II VC HLD Lens looks great and it also feels great in the hand with the smooth lens barrel design being quite comfortable to hold. 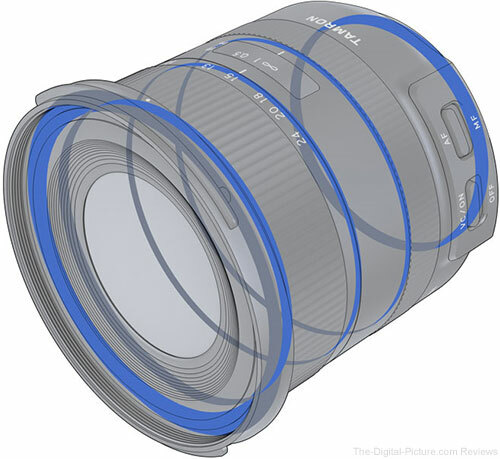 This lens has a slightly-extending design with full retraction occurring in the mid focal length range. The zoom ring is smooth with a nice resistance. It features rubberized ribbing that is raised slightly from the lens barrel. The raised ribs along with the abruptly flared front of the lens make the zoom ring easy to find. Both this ring and the focus ring rotate in the Nikon-standard direction (opposite that of Canon lenses). Many of you know that I do not prefer a rear-oriented focus ring as it is too easy to inadvertently adjust and my opinion in this regard has not changed with this lens. Tamron has made the ring small and less-grippy than the focus ring, helping to avoid related issues, but ... it is still not my preference if I get to choose. This lens' predecessor had a rear zoom ring design, one of the few features I prefer from the older lens. The switch bank is relatively low profile and the switches are raised and shaped ideally for easy use but remaining resistant to inadvertent changes. 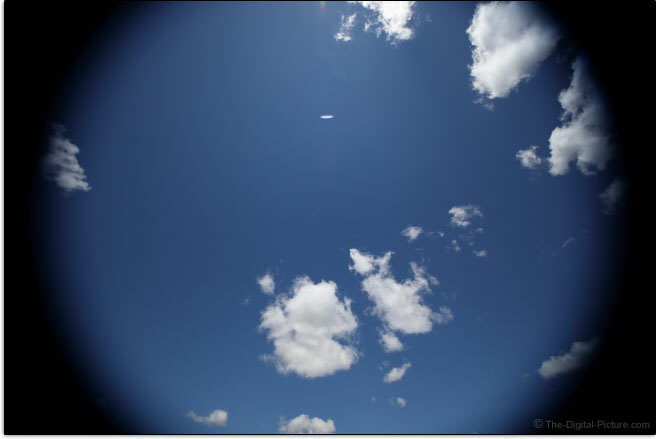 As illustrated above, this lens has received a weather-sealing treatment. While non-sealed lenses can be used in inclement weather with proper protection, a weather-sealed lens can save the day, especially if the need for sealing was not expected. The rear gasket seal can be seen in the product image below. The size and weight of this lens are ideal for long term constant use. While this is not a featherweight lens, it weighs in toward the lighter end of its class. 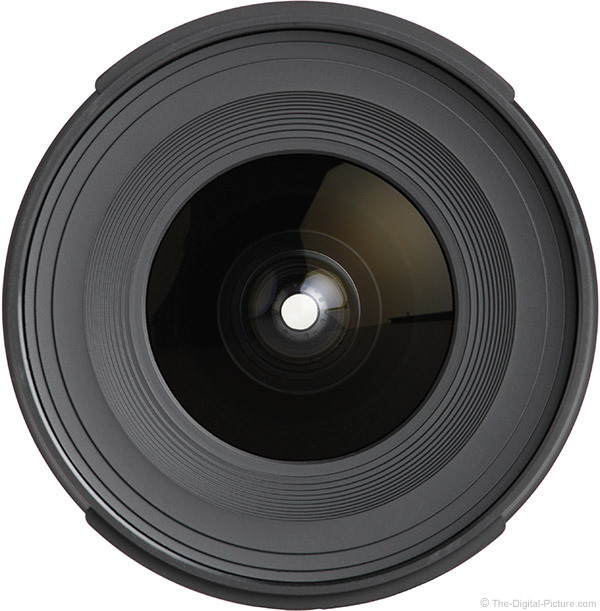 The dimensions of the lens barrel are adequate for a sure grasp and good control of the camera. For many more comparisons, review the complete Tamron 10-24mm f/3.5-4.5 Di II VC HLD Lens Specifications using the site's Lens Spec tool. The same lenses are shown below with their hoods in place. 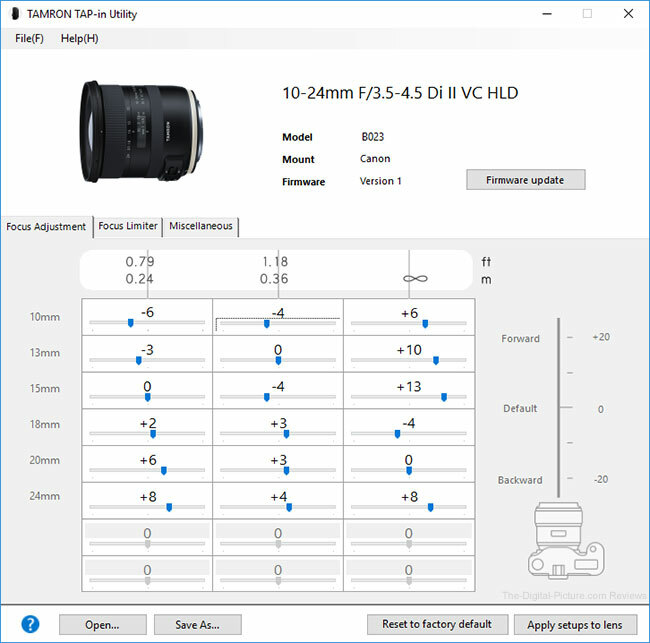 Use the site's product image comparison tool to visually compare the Tamron 10-24mm f/3.5-4.5 Di II VC HLD Lens to many other lenses. The Tamron 10-24mm VC Lens uses the highly-popular 77mm filter size, meaning that a high potential exists for sharing filters. 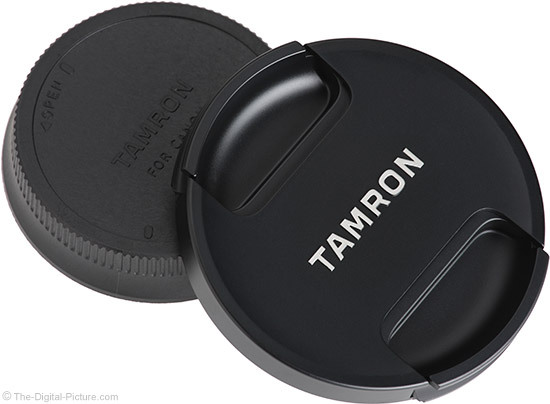 Tamron includes the plastic HB023 lens hood in the box. This hood is moderately sized and adds a nice amount of protection to the front lens element and also provides a moderate amount of protection from flare-inducing lights. The interior of the hood is ribbed to reduce reflected light from entering the lens. No lens case is included in the box, but finding a case for such a common lens size is not challenging. Check out Lowepro's Lens Cases. 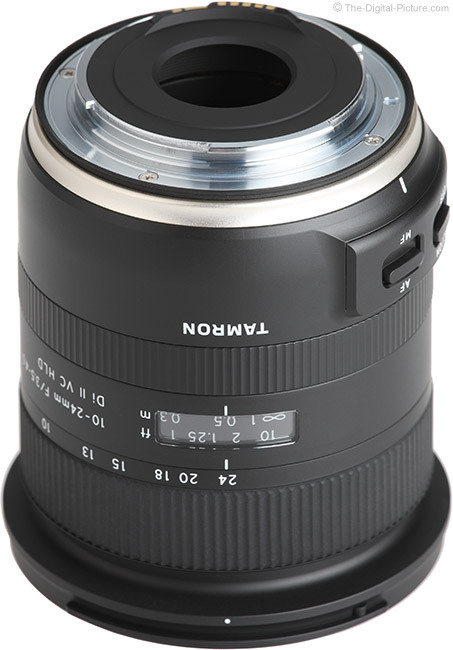 The Tamron 10-24mm f/3.5-4.5 Di II VC HLD Lens is compatible with the Tamron TAP-in Console. The TAP-in Console is basically a USB dock in the form of a robust lens mount cap with electrical contacts and a USB port that enables the lens to be connected to a computer. Once the lens is attached to the dock and the dock attached to the computer, the TAP-in Utility software application communicates with the lens and then checks for any available firmware updates. If an update is available, a dialog box is presented, providing the option to update the lens. There have been a number of Tamron lens firmware updates released recently, addressing compatibility and other issues. Having the TAP-in Console makes those updates very fast and easy, especially compared to the alternative of shipping a lens to a service center. Within the TAP-in Utility app, most will find the first tab, Focus Adjustment, to be the most important. Autofocus adjustments can be made at 6 focal lengths with 3 focus distance adjustments available at each focal length for a total of 18 adjustments available – enough to drive a perfectionist crazy. This lens did not require the adjustment numbers shown above – these were only used for illustration purposes. The last tab, Miscellaneous, provides control over full time manual focus override and the VC mode. 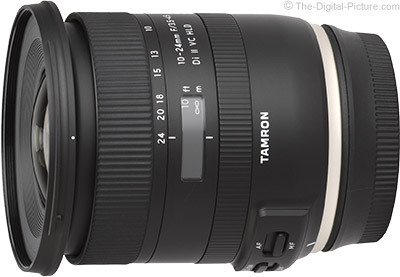 With a relatively low price, the Tamron 10-24mm f/3.5-4.5 Di II VC HLD Lens represents a good value. There are less expensive wide angle zoom lenses and there are far higher-priced options, but falling somewhere in the middle with a solid feature set, this lens is worth its price. That this lens is priced the same as its predecessor is another value-indicating data point. The Tamron 10-24mm f/3.5-4.5 Di II VC HLD Lens is available in Canon EF (reviewed) and Nikon F mounts. My standard disclaimer: There are potential issues with third party lenses. 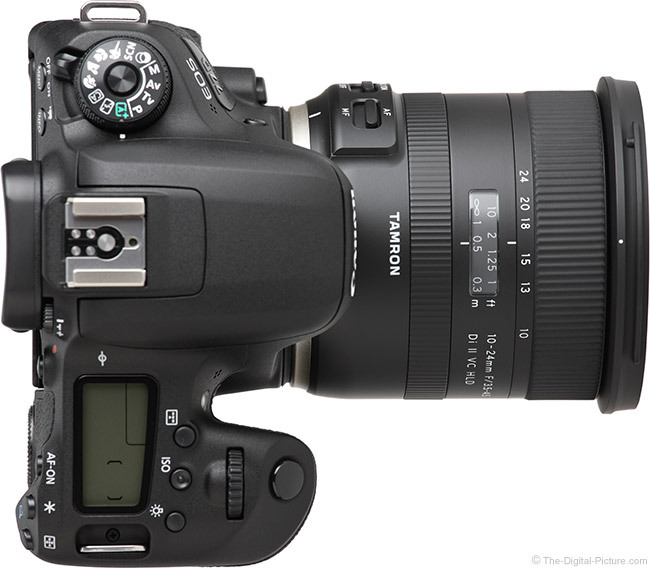 Since Tamron reverse engineers (vs. licenses) manufacturer electronics and algorithms, there is always the possibility that a DSLR body might not support a (likely older) third party lens. Usually a lens can be made compatible by the manufacturer via a firmware update, but this cannot be guaranteed. Compatibility with the Tamron TAP-in Console is risk reducing as Tamron can release firmware updates for console-compatible lenses. Tamron USA's limited 6-year warranty is superior to most. The evaluation lens was online-retail-sourced. The "Which wide angle lens should I get?" question is ... a daunting one to answer from an APS-C format perspective. But, I'll try to help you formulate the correct answer for you. First, the Tamron 10-24mm Di II VC HLD Lens takes its predecessor, the Tamron 10-24mm f/3.5-4.5 Di II Lens immediately out of the comparison. The new lens is priced the same as the old and it is a major upgrade in many regards including image quality. I don't see a reason to buy the old one and upgrading to the new lens from the old makes a lot of sense. If you need a weather-sealed lens, the Tamron 10-24mm Di II VC HLD Lens is, at review time, your only option. Note that the Tamron 10-24mm VC Lens also has the advantage of a much longer focus ring rotation (175°) than any of the other options being addressed here. If you need at least 24mm on the long end, only a pair of Nikon lenses and one Tokina lens remain in the competition. While the Nikon 10-24mm f/3.5-4.5G AF-S DX Lens performed quite well for us, the Nikon 12-24mm f/4G AF-S DX Lens we tested did not seem so deserving of its price. The 12-24 has a lower maximum magnification (0.12x vs. 0.19x). 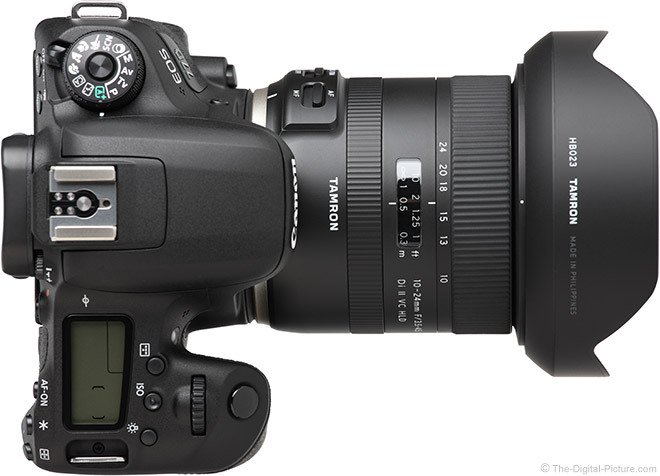 Both Nikon lenses are much higher-priced than the Tamron, especially the f/4 model. Though not as modern in design as the Tamron, the Tokina 12-28mm f/4.0 AT-X Pro DX Lens puts the biggest long-end focal length on the board – with an also-noticeable 2mm sacrifice being made at the wide end. The Tamron has an edge from an image sharpness perspective, especially at the longer end of the focal length range. The Tokina has modestly less geometric distortion throughout the longer half of the comparable focal length range. It also has less vignetting at the wide end and in some additional direct focal length/aperture comparisons. The 12-28's fixed max aperture is nice, but it falls in the middle of the Tamron's max aperture range. The Tokina has a modestly lower street price. If you want image stabilization in your wide angle zoom, your options are this Tamron lens or the Canon EF-S 10-18mm f/4.5-5.6 IS STM Lens. The Canon is the smallest, lightest and least expensive wide angle zoom lens option. The Canon has narrower apertures, more vignetting and less focal length range to its disadvantages with less geometric distortion to its advantage. The Canon, at review time, has the only focus-by-wire MF implementation in the comparison list. The Tamron is a better-built lens. If you want the widest angle rectilinear (non-fisheye) option, the Sigma 8-16mm f/4.5-5.6 DC HSM Lens is your choice. The difference between 8mm and 12mm is very big, though 16mm also falls well short of 24mm. The Sigma is a very good performer from an image quality standpoint with downsides including narrower max apertures, no front filter threads, a lower maximum magnification (0.13x vs. 0.19x) and a higher price. Another easy decision-making question is "Do you need to stop action in low light?" If so, the Tokina 11-16mm AT-X Pro DX II and Tokina 11-20mm AT-X Pro DX Lenses, with their wide f/2.8 max aperture available over their entire focal length ranges, may be your best options. Neither of these lenses provide the wider 10mm focal length and the 11-16 falls especially short of 24mm on the long end. The Tokina 11-16 II image quality competes strongly at 11mm f/2.8, though the 16mm end needs an approximately f/8 aperture comparison to match the Tamron. The 11-20 is a stronger competitor in this regard, with wide open image quality similar to the Tamron despite the much wider max aperture. Advantaged by their wider apertures, the Tokina lenses show some vignetting favor when compared to the Tamron at the same apertures and the Tokina models also have somewhat less lateral CA and modestly less geometric distortion. Both Tokina lenses have a much lower maximum magnification (.09x and 0.12x vs. .19x) and the Tokina 11-16 II shows more flare effects. The Tokina 11-16 II is slightly less expensive than the Tamron and the Tokina 11-20 is more expensive. The Tamron lens has a more-modern design. 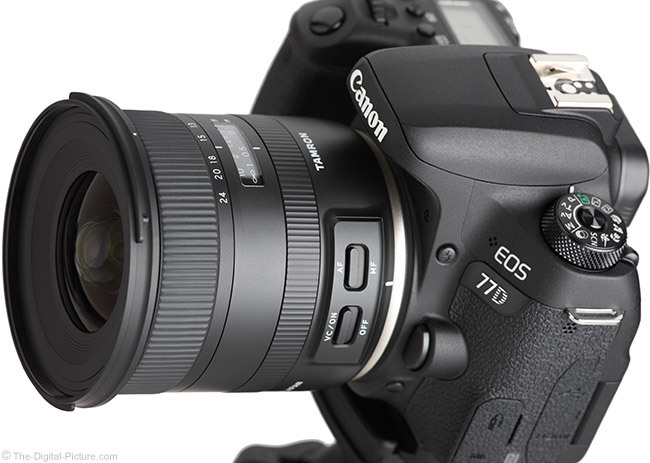 Many Canon DSLR owners will be considering their camera brand's own most-similar lens, the Canon EF-S 10-22mm f/3.5-4.5 USM. With wide open apertures, I see the Canon having modestly better image quality over most of the focal length range with the two lenses becoming close to similar at the long end. Stop down to f/8 and the differences even out significantly. The Tamron has more geometric distortion and the Canon shows more vignetting, especially at wide apertures. The Canon costs noticeably more. Sigma's most-Tamron-similar lens, the 10-20mm f/4-5.6 EX DC HSM Lens, appears to have been quietly discontinued, removing it from this option list. That leaves the 10-20mm f/3.5 EX DC HSM Lens as the remaining Sigma entrant. From an image sharpness perspective, I don't find the Tamron and Sigma lenses significantly differentiating themselves, though I see the Sigma having an edge when stopped down at its long end. The Sigma has modestly less geometric distortion and it has the wider (and fixed) max aperture advantage. While the Tamron has the regular price advantage, strong Sigma promotions can reverse this position. For some, the clear answer to the "Which wide angle lens is best?" question has been answered. For others, the answer is not so clear. Use the site's tools to make your own comparisons and rest assured that, if you can't decide which lens is best, there is probably more than one lens that can meet your needs. The 10-24mm f/3.5-4.5 Di II VC HLD Lens is an important member of Tamron's lineup. I think that all kits should have a wide-angle zoom lens in them and this lens just might be the best option for yours. The advantages of this lens start on the surface, with a great-to-handle shape and sharp looks. To get great images requires having a lens with you and the size and weight of this lens makes it easy to carry and comfortable to use for even long periods of time. Weather sealing is another advantage of the 10-24 VC, featuring a ready-for-whatever mindset by design. The image quality delivered by this lens competes well against the other options and when slow shutter speeds begin to adversely affect image quality, this lens' excellent vibration compensation system will, by far, differentiate it from most of the crowd. 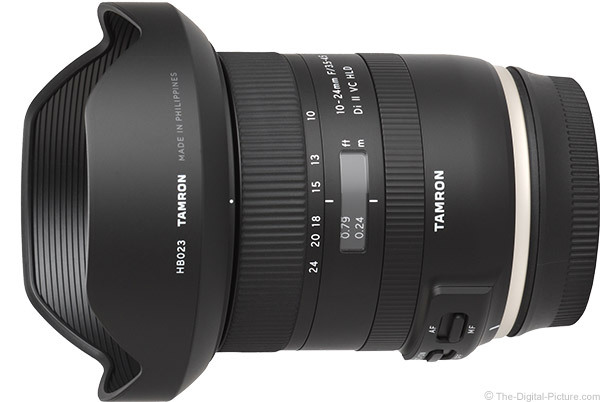 The Tamron 10-24mm f/3.5-4.5 Di II VC HLD Lens is worthy of your APS-C wide angle lens short list.